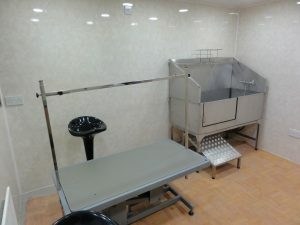 In our dedicated grooming room we can cater from anything from a quick tidy up to a full makeover for any breed of dog or cat. Your pet will love coming to us to be pampered and fussed over. See our gallery page to view our facility and meet some of our happy customers for yourself. We offer a home grooming service. 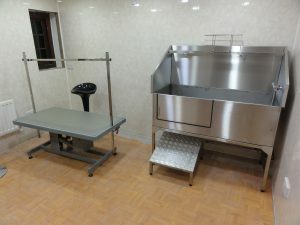 This service is particularly suited to elderly or nervous pets that will feel more at ease being pampered in the comfort and familiar surroundings of their own homes. Please contact us for details of the home grooming service. We also offer puppy starter sessions. These sessions help introduce you puppy to the idea of being groomed. They are specifically tailored to your individual pet’s personality and to get them accustomed to grooming at an early age. If there is anything your pet requires for their grooming needs, please do not hesitate to contact us and we will see what we can do to help. We can also groom other types of animals such as Rabbits and Guinea Pigs. See our Grooming Information page or contact us for more details.